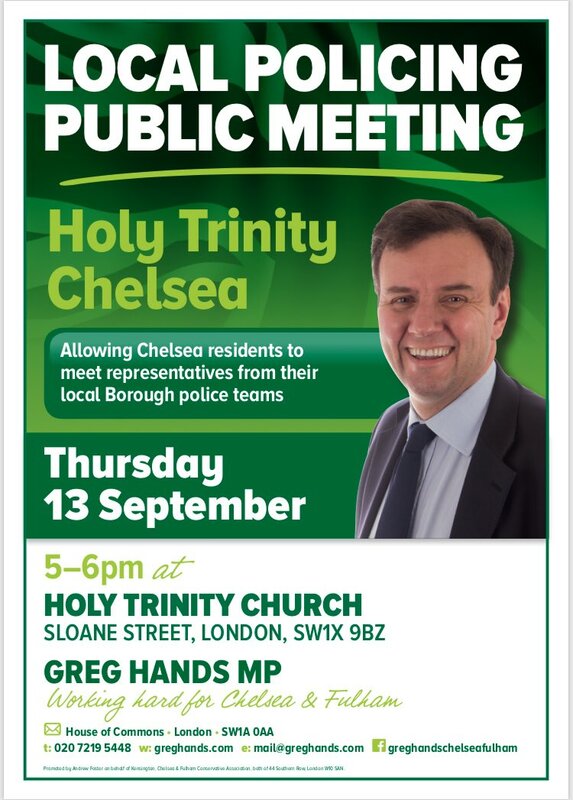 Greg will be hosting and chairing two local policing public meetings on Thursday 13 September, one in Chelsea, followed by one in Fulham. All constituents are welcome at either event. This is an opportunity for residents to ask our local police any questions on crime and safety in our area. Crime is a very serious issue in London, and that includes Chelsea and Fulham. Although overall crime continues to fall nationally, there has been an increase in violent crime offences recorded by the Police since 2014. These meetings will be principally an opportunity for residents to ask local police commanders about the practicalities of operational policing. For example, it is clear that moped crime is of particular concern in our area. Fortunately, there has been decline in such crimes in the capital since its peak in July last year, aided by the deployment of new tactics used by the Metropolitan Police such as the use of off-road bikes to aid pursuits and the use of DNA marker sprays to link suspects to the crimes. From Greg's MP postbag, he knows that burglary and robbery are also real concerns locally, as well as identity fraud. The Government has increased national police funding by £450 million for this year. Greg has welcomed the Government’s Serious Violence Strategy, in response to increases in knife crime, gun crime and homicide, which is backed with £40 million of Home Office funding. As residents will be aware, the murder rate in London has increased each year since 2016. The Government’s emphasis on early intervention through community projects offers the opportunity to help young people, particularly in the capital, to make choices and not go down the wrong path. The Early Intervention Youth Fund totals £11 million of new funding. In addition, a Home Office fund has been set up from which charities can bid for a share of £1 million to help steer young people away from gangs and violent crime. These measures are to be welcomed. We need to see a more cohesive response from the London Mayor, who has overall responsibility for policing in London through setting the Met’s budget and priorities. Crime fell under the previous Mayor. The Chelsea event is due to take place in Holy Trinity Church, Sloane Square, from 5-6pm on Thursday, 13th September. 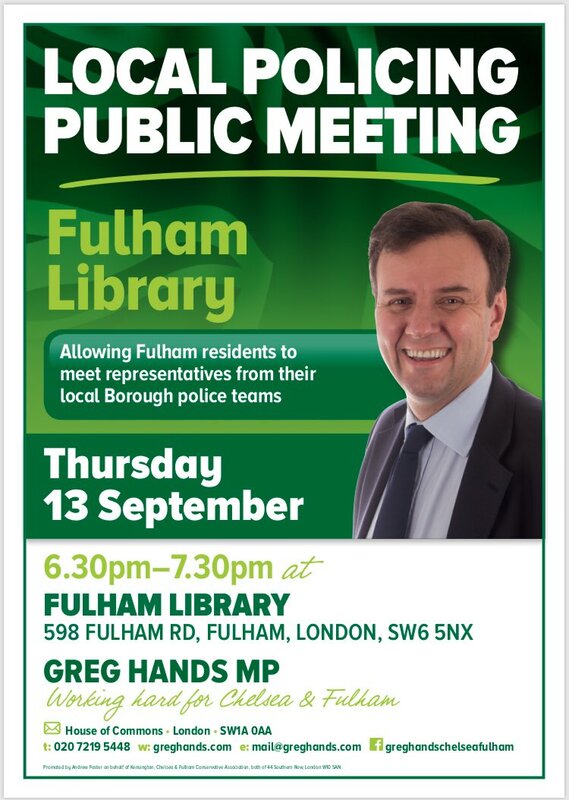 The Fulham event is due to take place in Fulham Library, 598 Fulham Road, London, SW6 5NX, from 6:30-7:30pm also on Thursday, 13th September 2018. Greg very much hopes to see you there. Both events are open to all Chelsea or Fulham residents. No RSVP is required.